If you like books about sisters who have to band together, but with very separate lives and stories, then Fog Season is for you! It’s definitely better if you read the first, The Sisters Mederos, but then it’s sensational! 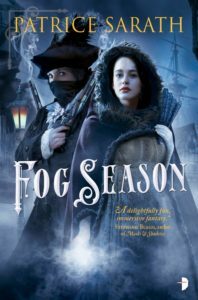 If you love books about sisters with thieves, gambling, and magic, then you have to read Fog Season and The Sisters Mederos. For me Fog Season gave me the added edge over the first because I love how we are able to dive more into Tesara’s magic. What always brings me back to these books is not only the sister relationship they have, which is fabulous and supportive, but the resourcefullness of our heroines. Faced with scrutiny, shame, and having to build up their family again, Tesara and Yvienne are up against it all. And Tesara’s new magic brings a whole new set of enemies to contend with. What kept me in love with this series in book one, the sister relationship, was only further developed in Fog Season. Taking on new hues as they come to face new challenges and obstacles (including love?) But what really sets Fog Season apart from book one is the mastery of plot. Sarath weaves us this story that includes tendrils of book one and a whole new set of adversaries and complications. If you thought book one was complex, book two takes it to an entirely new level. In this way, The Sister Mederos and Fog Season are the perfect duo. Because Fog Season certainly doesn’t stop developing Yvienne and Tesara, instead deepening our perceptions of them, and what they are capable of. In the face of all these new challenges and twists, they rise to meet the challenge, outwitting all around them, and leaving us wanting more. I sincerely hope there is a third because this is quickly rising to one of my favorite series, and siblings! Find Fog Season on Goodreads, Amazon, Indiebound & The Book Depository. Who are your favorite sisters? Maybe I should do a post about this!